Public Health England (PHE) has issued a report estimating mortality burdens associated with particulate air pollution for each local authority in the UK. Particulates (PM10 and PM2.5, particles with a diameter of less than 10 µm and 2.5 µm respectively), can travel deep into the lungs, leading to short-term respiratory and cardiovascular health effects. Long term exposure is associated with an increase in mortality risk. In the UK, annual mean objectives for the protection of human health have been set at 40 µg/m3 for PM10 and 25 µg/m3 for PM2.5; however, there is no safe level below which no adverse health effects occur. 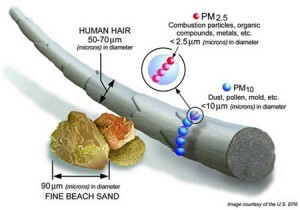 The PHE report focuses on the long-term effects of background PM2.5 due to human activity, i.e. fuel combustion (vehicles, industry, power generation, etc.). The report found that, in some parts of London, PM2.5 pollution contributes to 8.3% of deaths in people aged over 25, while the estimate for Somerset is 4.4%. The national estimate for the UK is that PM2.5 pollution contributes to 5.3% of deaths, which is 28,969 deaths per year.